The journal publishes research articles, book reviews and news (or possibly texts in other sections) concerning current scientific knowledge in the field of social education. The texts must be original manuscripts not published previously and not granted by the author to be published elsewhere. The editor’s office accepts manuscripts in Czech, Slovak, English and other languages – with English translation. Manuscripts are submitted as attachments to an email addressed to editorsoced@fhs.utb.cz or upon logging into the journal website interface (the log in link is in the bottom left screen corner). To simplify authors’ work, a template containing a published research article is available and information that author declares that this is the original study and text in this form has never been published or submitted for publication. Along with the template authors use title page. This document contains the authors’ affiliation (full-text does not indicate authors and affiliation), ORCID ID and contact information for potential reviewers. Please note that the publisher has the exclusive right to decide whether the proposed reviewers will be addressed or not. An example of the published article can be found here. 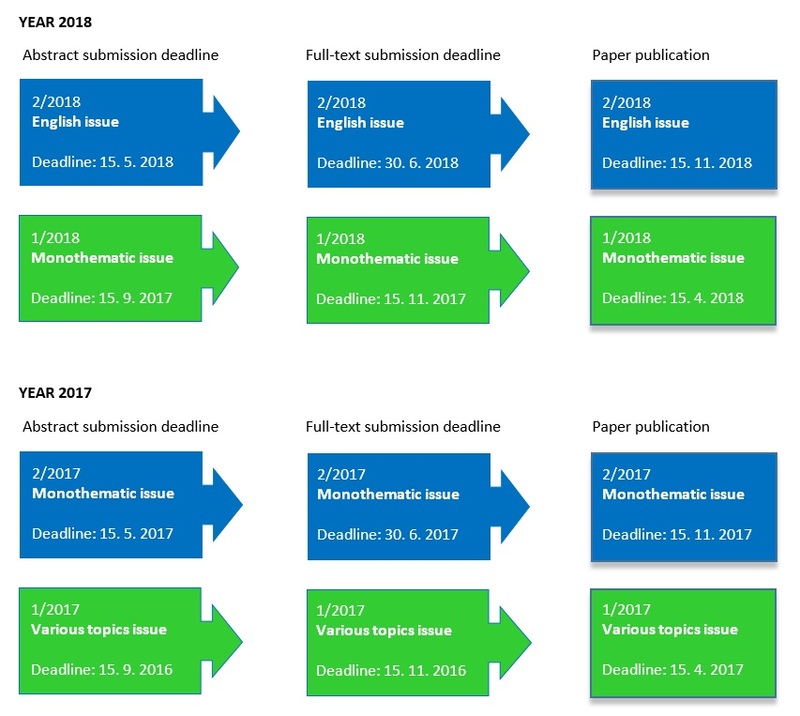 The review process of the article manuscripts is mutually blind and lasts from one to two months, based on the received reviews. The aim of the blind review process is to reduce the possible biases of the reviewers. The reviewers are members of the journal editorial board and part-time journal fellows. Reviews of books and news articles are reviewed by the editor of the appropriate section. The papers are checked by anti-plagiarism software Crossref Similarity Check before publication of an article. Editorial board has the exclusive right to have a final decision on publishing the manuscript, or suspend/exclude manuscript in any stage of the review process based on generally deductible reasons. However, the authors of manuscripts have no legal claim to the publication of their manuscripts at any stage of the review process. Based on the publication of the study the author concludes a Licence Agreement requiring the written signature of the publisher and author of a study published in the SocEd. Licence agreement is a bilateral legal act between the parties with a certain degree of confidentiality with regard to its content (including the identities of the contracting parties). More on journal publication rules here. CrossMark is a multi-publisher initiative from the Cross-Ref organisation to provide a standard way for readers to locate the authoritative version of a document. By applying the CrossMark logo, the Sociální pedagogika | Social Education journal (ISSN 1805-8825) is committing to maintaining the content it publishes and to alerting readers to changes if and when they occur. Clicking on the CrossMark icon will inform the reader of the current status of a document and may also provide additional publication record information about the document. Sociální pedagogika | Social Education (SocEd) journal’ policy on corrections is to replace the original article with a corrected version. If the corrected version is replaced before the correction notice appears in an issue of the journal, a data supplement correction notice is posted. Once the correction notice is published, it is linked to the corrected version of the article and the data supplement correction notice is removed. For retraction notices, when the retraction notice is published, the PDF version of the retracted article is removed and replaced with the retracted information. For the html version, explanatory language is included at the beginning of the Web page. Articles are to be focused theoretically, synoptically or empirically. The recommended maximum length is 45,000 characters including spaces covering all parts. Tables, pictures and charts should be prepared in colour. There must be no more than 10 keywords. In case the article is of an empirical nature, it is assumed the author will submit the full version of the research tool used in the research. This also applies when the tool is not a part of the article (it is unpublished). If not stated otherwise, the research tool is subject to the article review process (for the internal research review). The author may publish a maximum of one separate contribution/article per year or two as a co-author in the journal. The author proclaims that this is an original article unpublished previously in the present form and not submitted for publication elsewhere. Title of the contribution in preferred language and in English. Name and surname of the author (authors) excluding academic titles and the affiliation with the address and the author’s email address. Abstract in in preferred language and in English (max. 1,500 characters including spaces) suggesting the structure of the text. Keywords in preferred language and in English. Supplementary information on the originality of the text; please include the following text: The author proclaims that this is an original article unpublished previously in the present form and not submitted for publication elsewhere. An example of the published article can be found here. Abstract (max. 1,500 characters including spaces) characterizing the structure of the text. Avoid authorship comments, supplementary information, personal interpretations and evaluations of the document (i.e., avoid formulations such “in the article I positively evaluate a system that I consider to be very interesting”; instead, use “the article evaluates a system”). The characteristic features of an abstract are accuracy, lucidity, clarity, conciseness, exactness, and objectivity. The abstract introduces the structure of the argumentation and the construction of the text. In the case of an empirical study, the abstract contains theoretical points of departure, the research aim, methods, sample and major results. It is recommended that the appendices contain the full version of the used research tools. Sociální pedagogika | Social Education journal invites authors to respect the publishing recommendations made by the American Psychological Association, which for these purposes has issued Publication Manual (Publication Manual of the APA, 6th edition, 2010). Please read the manual before publishing / reviewing manuscripts for the Sociální pedagogika | Social Education journal. The pattern of the articles citations published in Sociální pedagogika | Social Education can be found here. All the requirements for text formatting are included in the article template. In the text, a work is referred to as follows: Průcha (2012) or (Průcha, 2012) or (Průcha, 2012, p. 51). The work of three or more authors is referred to as follows: Klusák et al. (2012). Literature contains only works referred to in the text. The works are listed alphabetically by the author’s surname, and they are not numbered. APA guidelines (American Psychological Association, Sixth Edition) are used for literature editing. Tollingerová, D., Knězů. V., & Kulič, V. (1966). Programované učení. Praha: SPN. Doyle, W. (1996). Curriculum and Pedagogy. In P. W. Jackson (Ed. ), Handbook of research on curriculum (p. 486–516). New York: Macmillan. Schubert, W. H. (1980). Recalibrating educational research: Towards a focus on practice. Educational Researcher, 9(1), 17–24. Further instructions on the APA citation style to be found here. Literature sources must contain doi details provided these are available. In case you are interested in the review process your contribution would go through, please refer to the for reviewers section. A graphic depiction of the review process is to be found here. Current and previous published issues can be found on the journal homepage or by clicking here. The editors check a received manuscript to determine whether it fits the journal’s aim and scope. Manuscripts out of the journal’s scope are rejected. Articles published fully or partly in other publications/websites are not reviewed or accepted. Please be aware that we check all submitted manuscripts for plagiarism. We use plagiarism-detection system to check for similarity to previously published documents. All manuscripts containing plagiarism (≥30%), including self-plagiarism (>6%), are rejected. Also we evaluate a formal form of the manuscrip: usage of the official template and APA citation standards. We use a double-blind system for peer review; both reviewers’ and authors’ identities remain anonymous. The submitted manuscript is peer reviewed by at least two expert. In some rare cases, according to the recommendations from editors and reviewers, a second round of peer review may be initiated. Please see section for reviewers. The decision to accept an article is based on the assessment given by reviewers and editors. However, we may reject a manuscript even after the review process if the editors think it is not suitable for publication. The maximum extent is 9,000 characters including spaces, i.e., 5 normpages (one normpage being 1,800 characters with spaces). The book under review cannot be older than four years (unless otherwise stated by the editor’s office). The editor’s office prefers analytical reviews to descriptive ones. Only reviews by authors who are not employed in the same workplace as the book author are accepted. A book written by a member of the editor’s office or the editorial board must not be reviewed for the journal by another member of the editor’s office or the editorial board. The extent of a news item is 9,000 characters including spaces, i.e., 5 normpages (one normpage being 1800 characters including spaces). News items should describe activities and events related to the field of social education. The extent is 27,000 characters including spaces, i.e., 15 normpages (one normpage being 1,800 characters including spaces). An expert essay deals with events in the field of Social Pedagogy. It is not subject to a review process and is only commented on by the editor’s office. Although welcomed as part of individual journal issues, expert essays cannot be classified as research articles. The journal uses a CC BY licence. This licence enables the broad public to disseminate, revise, add to and create new works based on the author’s work, including for commercial uses, provided that the author of the original work is referenced. This licence is recommended for maximum sharing and use of licensed materials (more here). The main principle is unlimited online access to scientific information enabled by the auto-archiving of the articles in open access journals. 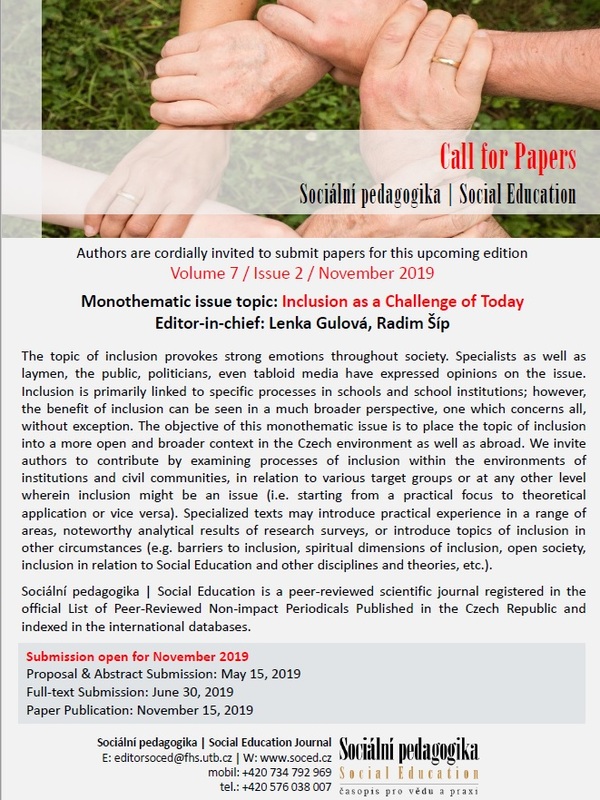 Sociální pedagogika | Social Education journal (SocEd) is a double blind peer-reviewed scientific journal. As the journal follows the open access policy, the articles are available free in the electronic form in the journal’s website. The term “open access” means unrestricted online access to peer-reviewed research, enabling any user to read, download, copy, print, search, or create links to the fulltexts of articles. As the publisher bears the cost of editing and publishing the journal, authors are not required to charge for publishing in the journal. Consequently, articles are available for readers free of cost. 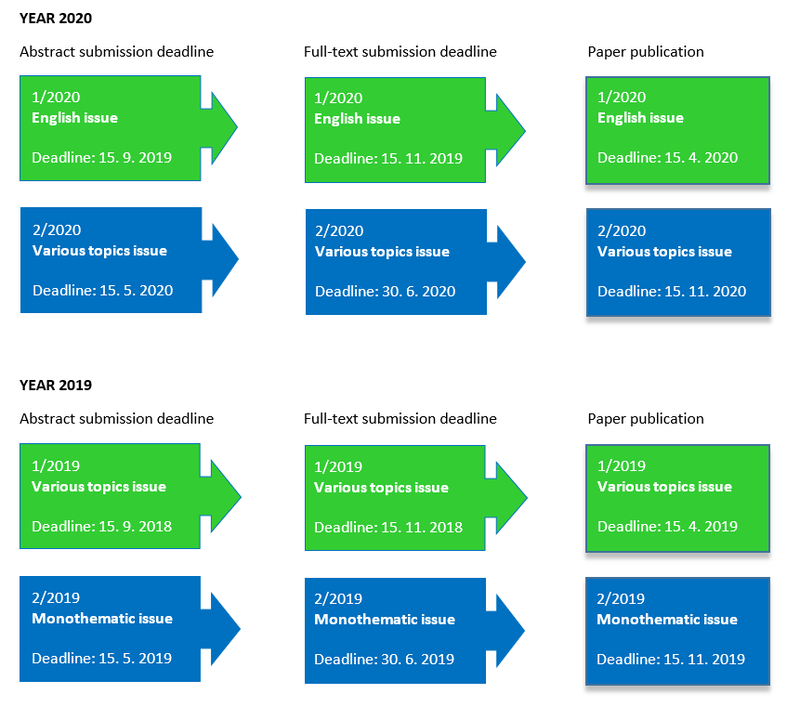 After the review process is completed, the author is addressed to grant the permission for publishing the final version of the manuscript in the journal. No reply within 7 days from the author to the publisher is conceived as the author´s consent. Before publication of the article, the author is asked to sign a contract of transferring exclusive copyright to the publisher (FH TBU). The author is not permitted to re-publish the article in other journal or other media without written consent from the publisher.